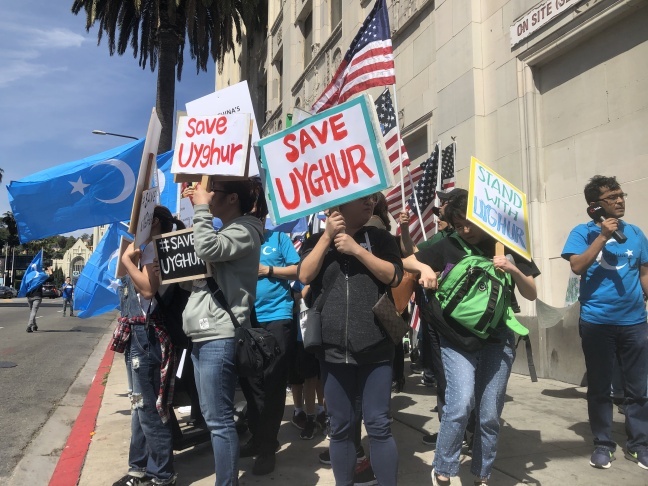 Uighur expats and supporters protest China's human rights abuses in Xinjiang on Hollywood's Walk of Fame on April 6, 2019. Last year, the international community learned China was detaining one million people in internment camps in Xinjiang — mostly members of a minority ethnic group called the Uighurs. 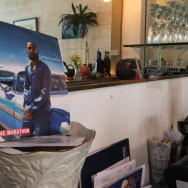 As their homeland in northwest China descends into a police state, Uighur expats in Los Angeles are teaming up with other groups to put more pressure on Beijing. In recent months, local Uighur activists have been hosting lectures across Southern California at Christian churches and Islamic centers to tell more people about what’s happening in Xinjiang. Uighurs speak a Turkic language and largely practice Islam. Eugene Fields is with the Council on American Islamic Relations in L.A.
"Unless it’s happening in your neighborhood, unless it’s happening to someone that you know, a lot of people push it to the back of their minds and they really don’t care," Fields said. "That’s why it’s important that people come out and march and protest." While U.S. officials have condemned China’s treatment of Uighurs, Congress hasn't approved sanctions to punish Chinese officials for human rights abuses. "We're here to support the Uighurs," said Ethan Espinoza, who was at a recent Hollywood rally with a Christian church group. "Our hearts hurt for what they’re going through right now and what their families are enduring. And we just wanted to show them the love of God in that way." The event was one of several protests that are popping up around the country calling on the Trump administration to act.